Home News Posts They used to be against the man. Now they are the man. Despite many in mainstream media who yearn to “fight the man,” they won’t, or simply can’t. The result is a corrupt, censored, and complacent media, courtesy of the government and allied business interests. But not Project Veritas. Every investigation we do doesn’t just expose the truth; it changes the narrative, makes an impact, and has an effect on our society. All because we buck the man. We go up against the powerful when others are too scared to. Our most recent investigation is a great example. Project Veritas went up against one of the most politically connected and powerful U.S. Attorneys in the country. And we exposed him for the animal he really is. Following our release, Mr. Letten said he “regretted” his behavior but only after his assertions in the video stating we were violating state and federal law were proven grossly inaccurate. This of course, further proves that the police illegally detained Project Veritas. Furthermore, Tulane graduate and well-respected lawyer Jonathan Turley defended our rights as journalists to confront Mr. Letten and stated there were no grounds for detaining us. This story received dozens of media hits including U.S. News & World Report, The Times-Picayune, Slate, World Net Daily, and more, enlarging its impact and echoing our message of truth to power. 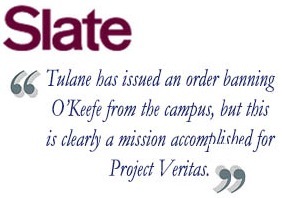 But this isn’t just “mission accomplished” for Project Veritas. This is mission accomplished for all our supporters. Thank you and now onto the next corrupt official and institution!